Tell me those aren't the sexiest tan lines you've ever seen. "The Sound of Sunshine," by Michael Franti & Spearhead, defines the auditory and visual sensations of warmer weather -- crashing ocean waves and friends chatting on the sand as the sun beats down from above. This Whole Foods recipe, on the other hand, epitomizes the tastes of summer in the candy-like sweetness of pineapple and the toasted earthiness of mushrooms made juicy by the grill. It's like a ray of sunshine for dinner. And who doesn't need that right now? This vegan, gluten-free-optional meal takes a little while to come together because of the time needed to marinate the mushrooms and pineapple, but the cooking step is a snap. Serve these burgers with a colorful bean salad and you've got a healthy, tasty preview of the coming summer! Wipe off the mushroom caps with a damp paper towel. Use a spoon to scrape out the gills; pop out the stems. Place the mushroom caps in a wide, shallow baking dish. Add the pineapple rings to the dish, reserving the juice for the next step. Next, make the marinade. Combine 3/4 cup reserved pineapple juice with the soy sauce, maple syrup, garlic, ginger, and sesame oil; whisk ingredients until smooth. (I zapped the mixture in the microwave for 15-20 seconds to make the maple syrup easier to mix in.) Pour the marinade over the mushrooms and pineapple rings; cover and set aside, turning occasionally, for 1-2 hours. 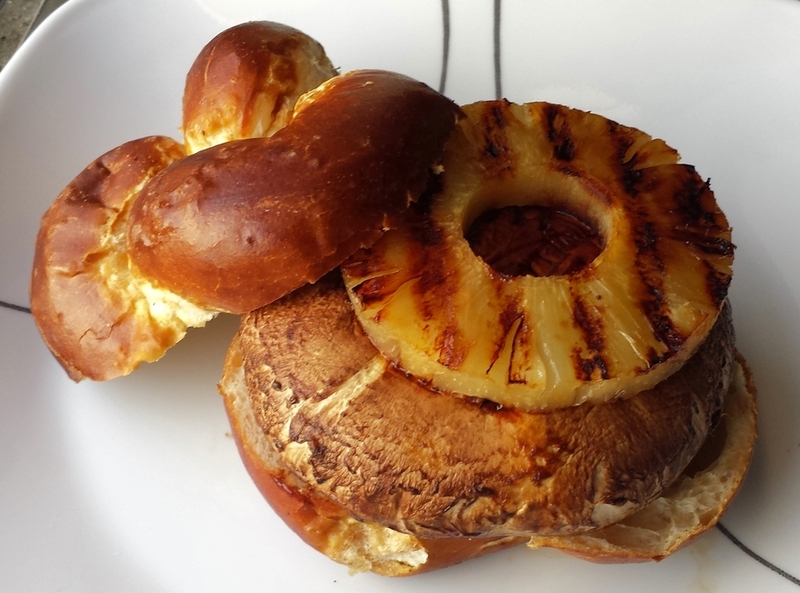 Grill mushrooms and pineapple for 4-6 minutes, gently turning them once after basting with the glaze. The mushrooms won't get very grill-striped, but the pineapple rings will develop gorgeous caramel-colored ribbons as the sugars break down. Place mushrooms on buns, top with pineapple (and lettuce, if desired), and another coating of glaze. Bring on the sunshine, please!